Kolkata was founded by Job Charnok in 1690. It was formed by amalgamtion of three villages called Govindapur (near Fort William), Kalikata (near Dalhousie Square) and Sutanuti (near Sovabazar). Kolkata is the home of India's Nobel Laureates: "Rabindranath Tagore", "Mother Teresa "and "Amartya Sen". All others are connected to Kolkata one way or other. * Kolkata is the "Third largest city" in the country, with a population of 5,080,519 and world's 8th largest metropolitan area as defined by the United Nations. * Kolkata has the second largest cricket stadium in the world, "The Eden Gardens", the biggest in Asia. * It has the world's third highest capacity football stadium and the biggest football stadium in Asia, "The Salt Lake Stadium". * The "Cricket and Football Club - CCFC" in Kolkata is the second oldest cricket club in the world. * It boasts of having the very first "Metro" in India, that too at a time when the very thought of having metro trains in India were impossible. * The one and only home of the "Trams" in India. * Kolkata has the largest open park, "The Maidan", third in the world after New york state park and the Hyde park in London. * It is the home of India's Oscar winner "Satyajit Ray", considered by many film makers, Western and Eastern alike, to be among the four greatest directors of film history. * Kolkata is the home of India's only Olympic medal winner in Tennis, "Leander Paes"
* The "Royal Calcutta Golf Club (RCGC)" is the second oldest golf club in the world, which was established in 1829 in Kolkata. * Kolkata is the main business, commercial and financial hub of eastern India and the northeastern states. It is home to the "Calcutta Stock Exchange" - India's second-largest bourse. * Kolkata houses "The Asiatic Society", "The Indian Statistical Institute", "The Indian Institute of Management", "The Saha Institute of Nuclear Physics" and the first IIT of India nearby. * The first post office was established by East India Company in Calcutta in 1727. This was shifted to the Court House building in 1762. This makes the Calcutta GPO the oldest post office in India. 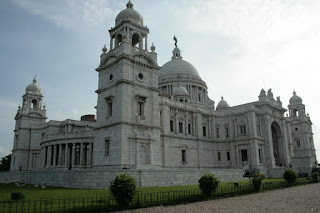 * Kolkata has one of the grandest colonial architectures in the form of Victoria memorial. * Kolkata high court used to be called the (first) Supreme court of India. ent has made it a "city of furious creative energy". The city also has a tradition of dramas in the form of jatra(a kind of folk-theatre), theatres and group theaters. * The "Indian Museum" in Kolkata is the oldest museum in Asia. 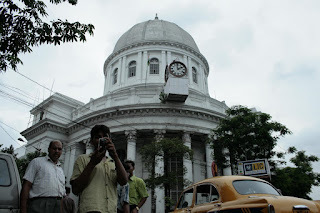 * Kolkata houses the "National Library of India" which is India's largest library. * Kolkata has an eminent place in the history of American diplomacy as one of the oldest "American Consulates" anywhere in the world, and the oldest in India. * The "Indian Botanical Gardens" is home of the world's largest banyan tree (the banyan tree with the biggest girth), which is around 240 years old. * "The Kolkata Book Fair" is the world's largest non-trade book fair, Asia's largest book fair and the most attended book fair in the world. It is the world's third largest annual conglomeration of books after the Frankfurt Book Fair and the London Book Fair. * "Bankim Chandra Chattopadhyay" was one of the earliest Bengali novelists and is popularly known as the author of India's first national song, "Bande Mātarom" (pronounced in Hindi "Vanderam"). * Calcutta University has been termed as the first modern university in the Indian subcontinent. * The Bengal Engineering and Science University, Shibpur is the second oldest engineering university in India, although it is not directly in kolkata, but it's root is in kolkata. * "Medical College", Kolkata is one of India's oldest medical institutions. * The first college for women in India, the "Bethune College" was set up in 1879 in Kolkata. * The "Indian Institute of Social Welfare and Business Management (IISWBM)" was set up in 1953 as the country's first management institute. 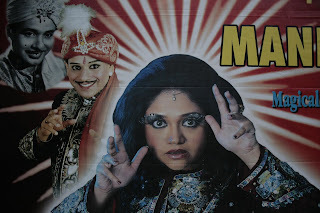 * It is also the hometown of India' s first Miss Universe title holder, "Susmita Sen". * Home of the First Indian Woman to swim across the English Channel "Miss Arati Saha" and First Indian Man to swim across the English Channel "Mihir Sen". * Kolkata the largest and the biggest selling outlet of Music World. * And who could forget that despite all the shortcomings, the difficulties and the pain, the people of kolkata always manage to put a smile of their face. That is why the city is named as "The City of Joy". The people of this city are also known for their helpfulness, their hospitality and their honesty!! * Kolkata is THE MOST LIBERAL CITY IN INDIA WITH MOST MODERN OUTLOOK TOWARDS LIFE. * Kolkata is home to the probably the largest number of little magazines in the world. Little magazine is a non commercial magazine which people bring out of passion - without thinking of monetary benefits - breaking their life savings. The life of little magazine is normally 5 yrs. * Kolkata has the highest concentration of artists and litterateurs in India. * College Street has one of the largest collection of book shops in Aisa. 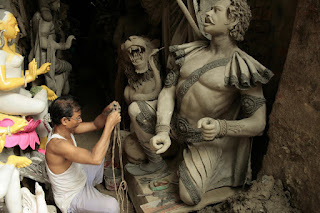 * Kumartuli is probably the most interesting and has the higest concentration of potters anywhere in the world. * Kolkata is the hometown of one the greatest musicians of India Ravi Shankar and Ali Akbar Khan. Still have a lot to catch up with obviously! But I'm working on it. Also I can't find you on facebook? Are you on there? About Darjeeling: I'm almost sure to go there from Monday onwards, I had a reply from a CSer who has a hotel there, but he is travelling at the moment and I can use one of the CS rooms in his hotel for Rs100 per night. It's a normal price for a good hotel there so either: a- It's a very good hotel and he's renting it for a cheaper price for CS, or b- He's using CS to promote his hotel!! Anyway I'm still happy that I got an answer to my CS request! Take care, see you tonight. Come with me to Some Place Else man! Kolkata is not Susmita Sen's hometown but her father's probably. Or dadur bari ekhane. your right! it was mentioned not very strictly. incidentally her dadu was my father's neighbour!